This complete set of specially designed, heavy weighted utensils, developed for people living with Parkinson's disease or other disorders that cause hand tremors. The weight of these utensils decreases the shakiness and enables the users to feed themselves and maintain better control of the utensil. These Weighted Eating Utensils are between 8 - 9 inches in length and each weighs approximately 1/2 pound. 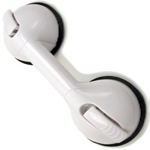 The heavy, gray vinyl handles feature indentations for the fingers which offer an easier and more comfortable grasping. The fork tines, spoon bowls and the knife blade are all made of quality stainless steel. They are available in sets of 4 or 5 pieces. Both sets include a knife, fork, teaspoon and soup spoon. 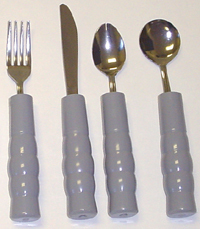 The 5-piece set also includes a tablespoon.